TurgeonEngineering.com provides information about the company, so you can learn more about the history of the company, its employees and the projects that we've taken part in. Additionally, we have listed first-hand testimonials from all of our customers, proclaiming their immense satisfaction with the service we provided. 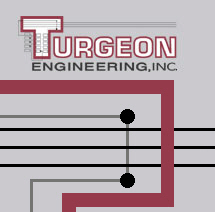 If you're interesting in learning more about Turgeon Engineering, click on a category below. This page provides historical information about the development of Turgeon Engineering Electronic Design Automation (EDA) software for IC design, available test equipment and testing methodology and capabilities (IC TESTING), computer network and peripherals (NETWORK), and completed IC designs (ICs COMPLETED). This page provides a brief summary of each of Turgeon Engineering's employees, including education and work experience. Read what Turgeon Engineering's customers have to say about the company and the work it has provided. This page provides brief descriptions of the key functions of some of the ICs designed by Turgeon Engineering. The ICs contain a wide range of voltages, currents and speeds, and are used in a variety of applications.